How many of you have at one time or another woken up unable to speak or move? If you have, you are not alone. The classic definition for this phenomenon is called sleep paralysis. It may last a few seconds, several moments, or even longer, and usually occurs right before you are about to fall asleep or wake up. Many people report feeling a “presence” that is often described as malevolent, threatening, or evil, and usually experience a tremendous amount of terror. The presence is usually seen, felt, and even heard. People also report unique experiences like the sensation of floating or being outside the body. They believe the phenomenon to be an extremely spiritual one. 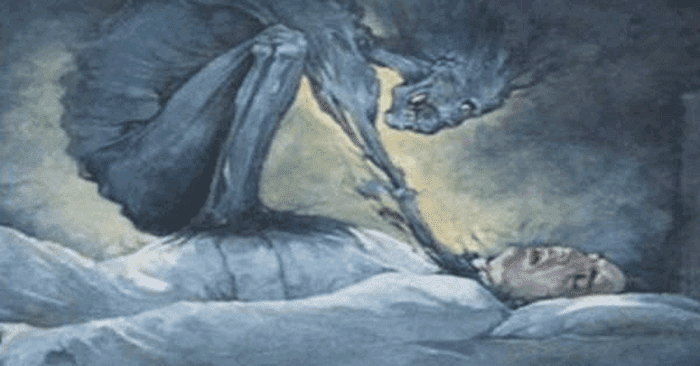 Right from the get go, almost all scientific approaches to the phenomenon of sleep paralysis assume that the experiences that stem from it are hallucinations. Rather than coming from the standpoint of complete neutrality, most studies completely shut out the idea of any reality behind “hallucinations.” Just because there are measured biological and chemical activities occurring during sleep paralysis does not mean there is a causal relationship between the two. There are other things we must take into consideration and as quantum science is showing us, there are definitely worlds within our world that we are not yet able to perceive easily. There is definitely a non-physical aspect to science in general that we are just beginning to wake up to. Modern scholars have found spirit and spirituality hard to define, and as mentioned earlier, usually place these topics within the circle of ridicule amongst the scientific community. Many reading this probably have a good idea of the terms that fit under the umbrella of “spirit” or “spiritual.” They involve out of body experiences, visits from entities not of this world, near death experiences, frequency, vibration, and more. It's important to realize that many experiences people have within the “spiritual” realm occur when one is fully conscious, awake, and alert, and not during what sleep researchers call sleep paralysis. It's quite possible that our level of scientific understanding is not advanced enough to explain certain phenomena, so sometimes they are grouped into the category of hallucinations, when really, they are simply things we do not understand and cannot yet explain scientifically. At the same time, some what people experience during sleep paralysis could very well be hallucinatory, although I don't believe this to be the case. I am very open to the idea that what is experienced for some during “sleep paralysis” is indeed intertwined with the true nature of reality – a reality we clearly do not yet fully understand. The point is we don't yet know for sure, and for the scientific community to assume and label them as definite hallucinations and as a figment of the imagination is limiting. It's interesting that there is also science and official research behind these types of phenomena which lend them further credibility. It is even more interesting that this information lies within the hands of the intelligence community, extremely classified and washed away in secrecy, just like the experiments conducted at Stanford University. Among the varied hallucinations associated with sleep paralysis, out of body experiences and vestibular motor sensations represent a distinct factor. (5) Remote viewing is the ability of individuals to describe a remote geographical location up to several hundred thousand kilometres away; this phenomenon has been proven time and time again, and shortly after its publication the program was instantly shut down by the department of defense. We have many examples of phenomena that would fit under the “spiritual” umbrella, and who are we to say that the experiences that occur within sleep paralysis are not indeed real? Sometimes, ideas and concepts can be a threat to power, to control, and to the overall perception humanity has of reality as a collective. If you change the way you look at things, the things you look at change. If the planet changed the way it looked at sleep paralysis and other inexplicable occurrences, surely this would contribute to one of the biggest paradigm shifts the planet has ever seen, and this is exactly what is continuing to unfold on planet Earth today. When I was a child, I remember having a number of lucid dreams. They seemed so real and I felt one hundred percent conscious during the experience. I was able to do whatever I desired whilst dreaming. My first experience with sleep paralysis didn't occur until I was a little bit older. The very first time it happened I remember suddenly waking up from a loud bang, a bright flash of light (although my eyes were closed), and a loud ringing in my ears. I had the ability to open my eyes, but I couldn't move my body. It's almost as if my brain was awake but my body was still sleeping. I was terrified, and the reason I didn't open my eyes is because I felt the presence of two beings on my left side, and two beings on my right side, and I didn't want to see. Whether they were there or not, I don't know, whether I was dreaming or not, I don't know. Keep in mind that experiences like this can occur when people are totally conscious, driving down the street, going about their everyday lives. Many people have totally conscious experiences with things that seem to be beyond our understanding, and they are not paralyzed or asleep. I have also had bizarre experiences while conscious, which might contribute to my bias on this subject; I do believe that what people experience during sleep paralysis is more than just a trick of the mind. This particular experience I had during sleep lasted approximately five minutes, until I totally regained consciousness. On another occasion, I again woke up in the middle of the night. I could open my eyes and I was totally aware of my surroundings. I was on the road in a hotel room by myself, I could see the TV, I could see the lamp in the corner of the room as well as the chair. I could not turn my head but I could look around. Although my eyes felt heavy, I could indeed open them. I couldn't move and was pretty scared, I remember thinking “not again, why is this happening to me.” I saw a dark shadowy figure come through the window, it seemed about 5 feet tall, I was on the left side of the bed and the window was in the right corner of the room. It came across the room, across the foot of my bed to the left side of my head. It put its mouth up to my ear and started to whisper rapidly. I could not understand what it was saying, but it was whispering extremely fast. I had a few other experiences after that which were pretty scary, and I started to desire more because I realized that although I couldn't move, my consciousness was still there. I was still awake, alert, and able to perceive the environment around me. The next time it happened, I assured myself that I would not react in fear, and that I would instead embrace the experience and try to “play” with it, explore and use this state of consciousness for further discovery about a potential world we are not usually able to experience. The next time it happened, I reminded myself to stay calm, enjoy it, and see what happens; this time I actually wanted to communicate with whatever I perceived to be there. When I did this, nothing presented itself. I still couldn't move, but didn't try to jolt myself out of it. I tried to float out of my body and was successful. I fully floated out of my body, but could only go so far, about one meter. I tried to go further but it was as if I was still attached to my body. This was a very cool experience, but unfortunately, after making the decision to try to manipulate the situation, the experience ended and I never had it again. These type of occurrences are definitely intriguing, and nobody, including researchers within the scientific world, should dismiss the experience one has during sleep paralysis as completely false. The scientific community should be comfortable in a place of neutrality, instead of characterizing something as false without sufficient evidence to back up the claim. There is no need for ridicule. I hope I've provided enough information within the article, as well as adequate sources for you to further your research if interested. If you have experienced this phenomenon, I'd love for you to share your experiences within the comments section. Thanks for reading.